Products - science toys,educational toys,ant toys-Yantai Oisee Toys Co., Ltd. Through constant innovation and improvement, the gel become more and more stable and natural marine biological extracts ensure a non–toxic and safe environment . Like a crystal palace ,the blue transparent gel provides the ants with necessary nutrition and water instead of soil. You can own a little pet that you don’t need to feed /bathe and remove fleas . For those science-lovers, Ant artists series are the best tools to observe and study ants. For the curious children , ant artists allow them to have a new understanding of insects and nature through their careful observation. Kids can learn to think ,ask questions by themselves and inspire their love for life, nature and science . Science toys are based on scientific principles. children can acquire the knowledge about solubility, saturated solution, supersaturated solution and crystallization through operating with their own hands. Also they can experience the magic of science and the happiness of creation by themselves . The magic crystal could appear in front of you just in several days with a dazzling shine ,Instead of natural formation.after millions of years. Attentive children can also observe the influence of temperature and the environment on crystal growth,as well as the subtle changes by themselves. As the crystal grows freely under uncontrolled conditions ,you will be surprised by the wonderful crystal. Let’s start the maigic crystal journey. 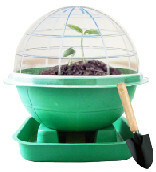 U-plants is a new scientific experimental product for plants growth，which enable children to fill the cultivating substrate, sow seed and water. Through carefully tending，children can experience the whole process of plant growth：breaking through the earth，growing sturdily and blossom .Children would know what plants growth need and how much in this process ,In addition，children could come up with more questions，which will guide them to think actively and find answers from their practice. Children could experience that harvest comes only by their hard working. As some beautiful flowers and common vegetables are selected for this series, U-plants can bring children into the plants kingdom and let them understand the relationship between plants and the earth. U-plants could make children understand how foods and vegetables grow out. A tornado is a small range of air vortex, strong, is extremely unstable weather the strong convection by air movement generated by thunderstorms, funnel cloud stretching to the ground of cloud base (Long Juan) have a strong whirlwind, the wind up to 12 or more, up to 100 meters per second over, general thunderstorms, sometimes accompanied by hail. A tornado is a very creative science toys, the product is in order to allow more children understand tornadoes and R & D products. Shake the can see the different forms of the tornado, help us understand the tornado causes; to cultivate good moral character of children care for the environment. 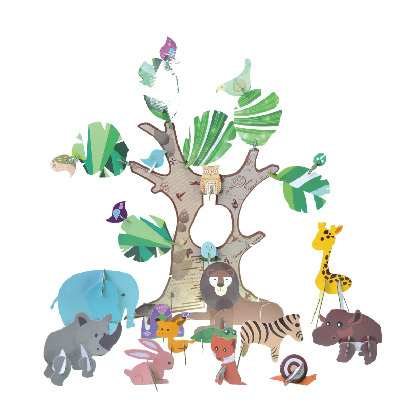 Katutu paper crafts, made of green cardboard ,make children compose different lovely models, Such as animals, houses , and cars. Besides, children are also able to create and enrich the tale kingdom by their own brush. Katutu paper crafts give children a space full of free creation and flying dreams. Moreover ,it’s one handcraft product to inspire and cultivate children’s art talent. Katutu paper craft ,consists of two branches ,Creative Class and Dream Space.